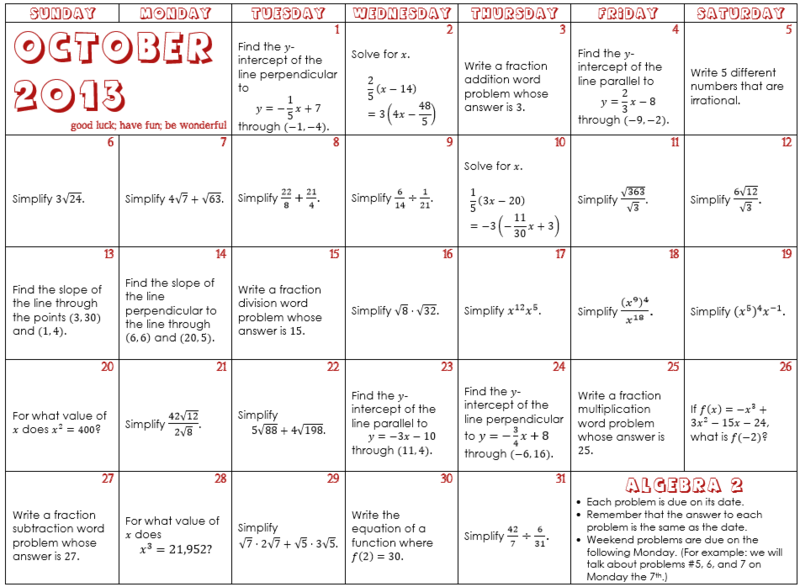 I’ve decided to continue for another month with the problem calendars. I think they serve their purpose well: a nightly reminder that the things we learned earlier in the year still exist and are still important to know. 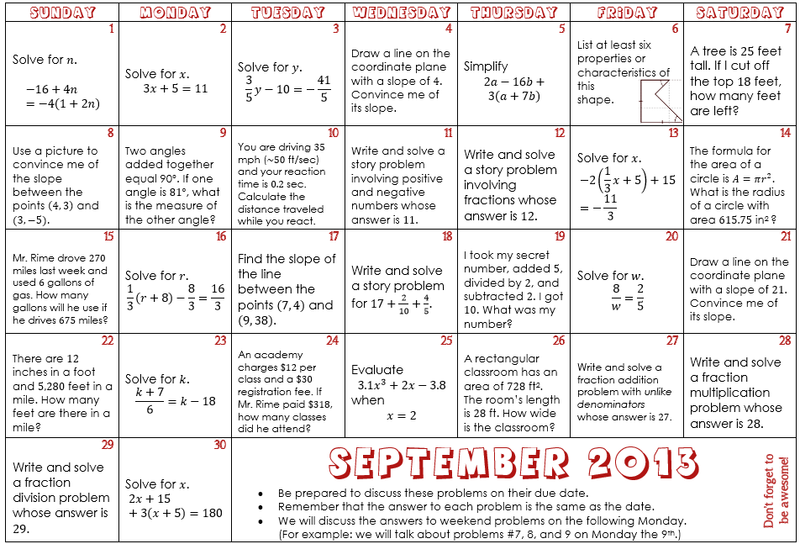 This month’s version of the problem calendars are all review, as opposed to last month which had some preview questions thrown in. My focus shifted a little, toward using these as strictly review. Whether that’s better or not… I don’t know. (Ask me in a month.) Also, none of the questions say “Convince me,” because that is now an expectation in everything that we do in class. By the way, if you used my calendars last month… I apologize for the errors (all undoubtedly mine)! I think (hope!) I did a better job of making every question have the date as its answer. Let me know if you find any errors. Pretend I’m a modernist as I present to you ramblings from the first week of school. The first days of school. I own that book. I don’t put a lot of stock in it, though. What I do put a lot of stock in after the week I recently wrapped up is Rachel Rosales’ name card idea. I’m already developing an amazing relationship with my students and I’m willing to bet a large part of that is the ongoing dialogue we started on that first day. When I told them that Friday was the last day we’d be doing it, multiple students in multiple classes practically begged me to continue it. So there’s that. This past summer I started learning Spanish by taking a one month immersion class for eight hours a day. I learned a lot and it was an amazing experience, but, of course, I still know so very little. It’s humbling to remember that for many of my students, they don’t have the choice of signing up for an immersion class because every day at school is English immersion—in addition to whatever content they’re supposed to be learning. I included a box on my parent information sheet that asked if parents would prefer to communicate in Spanish. Somewhere around 50% would. Last year I (1) would not have known that and (2) would not have been in a position to reliably do anything about it. A handful of students wrote on their name cards that they only speak a little English. Seeing them go from writing a short sentence on day 1 to writing a confident, full reply on day 2 because I responded in Spanish makes that month of work in the summer completely worth it. I really like the feel my classes have so far this year. There are a couple that are still a little timid when it comes to working with one another, but in every class, students are willing to work hard and help each other. When we have class discussions, the entire class is involved. When I ask them to stop and think, they do. When I ask them to share with their group, they do. When I ask them to try something, they do, even if they don’t immediately believe they’ll be successful. It feels like they trust me not to waste their time doing things that won’t help them learn mathematics. And I think those are some of the most important outcomes of a first week of school. Actual things we actually did. 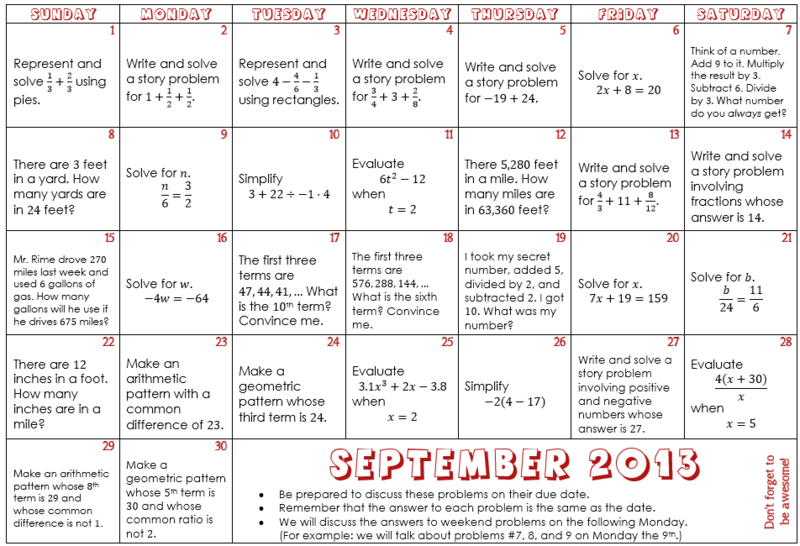 In algebra 1, we played a lot with patterns, including “what will step #30 look like?” and “how many whatevers will be in step #50?” In the next week I hope to slowly introduce students to writing equations. In algebra 2, we reviewed algebra 1 material like function notation and solving equations. We also begin to hint at function transformations by looking at what happens to a graph when you add a constant to the function it represents. 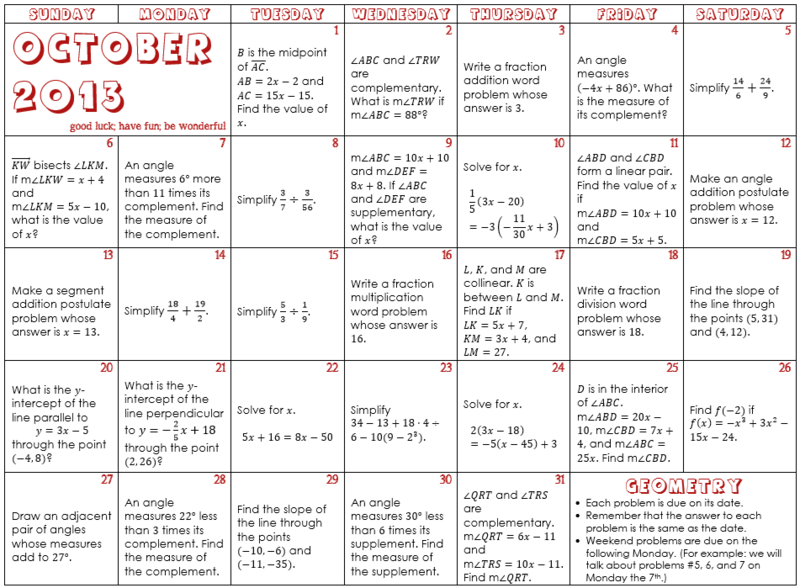 In the next week we will explore the Five Expectations and review linear functions. In geometry, we explored properties of geometric figures. We formally defined the triangle and square, discovered or remembered properties of those figures, found counterexamples for misremembered properties, and completed our first proof (that the sum of the angle measures of a triangle is 180°). It’s perhaps worth mentioning that the first proof of last year happened in like, December. Also: spontaneous applause occurred when the first proof of the year was completed. 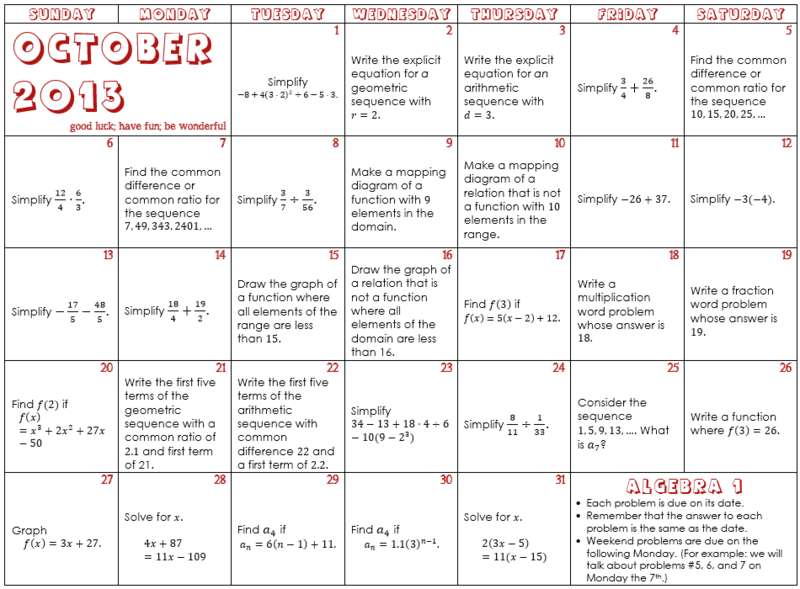 Heather Kohn posted her calendar project. Then Kathryn Freed posted her warm-up version of the calendar. 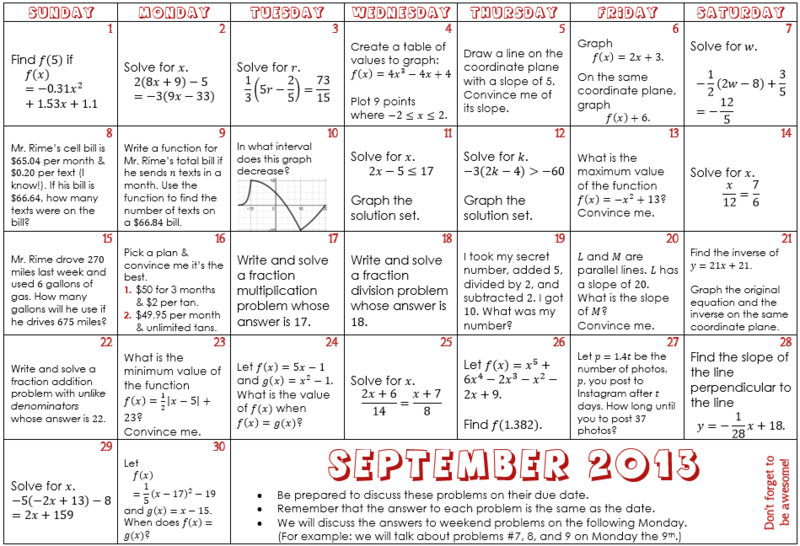 And now I’m posting my nightly homework version of the calendar. One plan I have for homework this year is to be more intentional in allowing (and requiring) students to talk about their homework in class. I had already planned to give students time at the beginning of class to work with their teams to respond to the feedback I left on the previous night’s homework. My new plan is to do the same thing, but to also use the time to talk about the problem that was on the calendar for that day. Thanks to Heather and Kathryn for posting their versions. Many of my problems are shamelessly stolen from them.